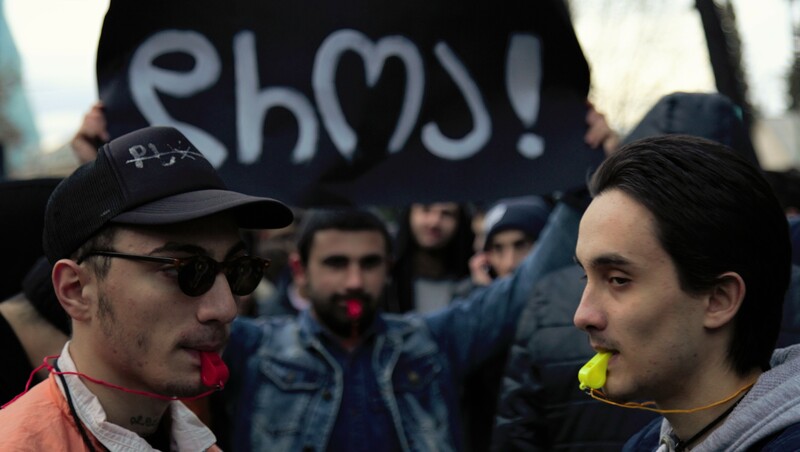 White Noise protesters gather in Tbilisi on December 10, 2016 to call for the decriminalization of drug use. "It's time for change," a protester's poster reads. A Georgian political party plans to ring in the New Year by planting weed as an act of civil disobedience against the Caucasus country’s stringent anti-drug policies. Members of the party, which, incidentally, has the botanical name of Pine Cone (Girchi/გირჩი), are inviting likeminded individuals to join them in a pot-planting fest a minute before midnight on December 31. Anyone of age is welcome to come along, Pine Cone said in a press release. The procedure, staged at the party’s main Tbilisi office, will be broadcast live in a bid to push the Georgian government toward the full decriminalization of marijuana use. The name of the broadcaster was not given. Perhaps for good reason. Police already have said that they will respond according to the law, which mandates prison sentences of six to 12 years for an organized, group cultivation of psychoactive plants. If they follow through, some extra prison space might be needed -- so far, up to 553 people have signed up to plant pot, according to the Pine Cone site. Another 1,673 said they support the protest. “Having cannabis seeds is not a crime as such, but the moment I do this, I become a criminal,” Pine Cone member Vakhtang Megrelishvili commented to newscaster Rustavi2, as he placed some seeds into a pot and watered them. Pine Cone anticipates that its seed-soirée will prompt the authorities to either move toward legalizing marijuana use or to arrest everyone who turns up at the party. Another option for officials – ignoring the whole thing altogether. Casting it as a “fight for individual liberty,” Pine Cone has long pushed for decriminalizing marijuana use, but both its proposed bills and its own bid to win parliamentary seats this year have fallen flat. To inspire support for its New Year pot-planting rally, the group is posting online famous examples of civil defiance, such as Rosa Parks’ stand against racial discrimination in the US and Mahatma Gandhi’s Salt March against British rule in India. Whether or not these examples will catch on, the tiny party has effectively placed itself at the heart of one of Georgia’s prickliest national debates. Much of the criticism of Georgia's drug laws centers on the fact that they often do not discriminate between drug user and drug dealer. This not only confounds official statistics, but can severely impact those convicted of violations. Possession of more than 0.2 grams of heroin, for instance, counts as drug-dealing and is subject to a jail term of at least five to eight years. Less than 0.2 grams ranks as intended for personal use and carries a financial penalty for first-time violators. At the same time, the law does not always define the amount of more prevalent drugs (such as desomorphine, known in the ex-Soviet world by its street name, “krokodil”) that qualifies as intended for personal use, noted Guram Imnadze, a legal analyst with the Human Rights Education and Monitoring Center. A civil-disobedience movement, White Noise, which Imnadze supports, takes particular issue with the lack of such distinctions. They argue that drug users need treatment, not prisons, and advocate for the decriminalization of all narcotics. Some key officials, including Prime Minister Giorgi Kvirikashvili, have indicated that they might soften Georgia’s anti-drug policies to a degree, but opposition to full decriminalization remains strong. That said, faced with increasingly vocal criticism over Georgia’s zero-tolerance drug policy, some changes have begun. In an historic case last year, the Constitutional Court struck down a law that imposed lengthy prison sentences for citizens caught with small amounts of marijuana. For now, however, Georgia stands largely alone in the region in publicly pushing for the legalization of marijuana. Similarly, the issue may not rank as a critical one in rural Georgia, where the lack of decently paid work remains the primary concern. But even if many outsiders do not rank the Pine Cone party as one of history's great Rosa-Parks or Gandhi-like moments, no sign yet that that will defeat these campaigners' spirit for change.